A traditional gangster style hat. Excellent for any member of the "mob", Captain Keller in "The Miracle Worker" could wear a pork pie hat, as could Linsley in "Mame", Daddy Warbucks in "Annie", and of course, Big Jule in "Guys and Dolls". 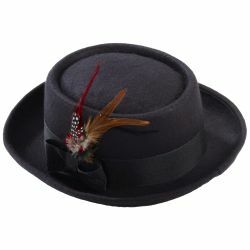 The hat features a flat top round crown with a narrow brim, ribbon band, and feather trim. Hat is one size fits most up to a 23” head measurement.